Snail farming in Africa is one of the top interesting business opportunities on the continent. West Africa is home to the largest species of land snail in the world. The Giant African land snail (Achatina species), is known to grow up to 30cm in length and can be found in the dense tropical rain forests across the region from Guinea, Liberia, Sierra Leone, Ivory Coast, Ghana to Nigeria. 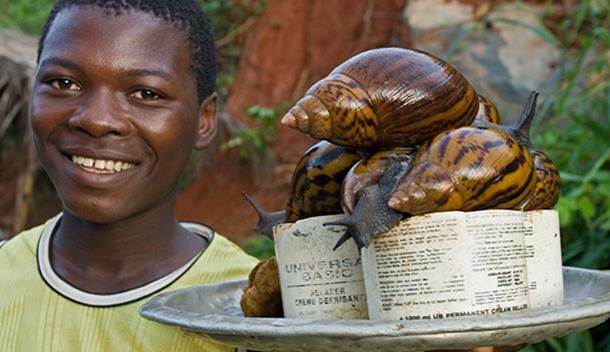 For hundreds of years, Africa’s appetite for snails has been served through traditional means. Snails handpicked from the bush (usually in the dead of the night) have been the only way to get snails to the market and dinner table. However, as Africa’s population explodes and our forests continue to be sacrificed to build cities, the (bush) supply of snails cannot keep up with the soaring demand. This has created an opportunity in the market for snail breeders and farmers who now cultivate these interesting creatures on small farms and in their backyards for impressive profits. Snails are a huge part of the diet in many parts of Africa, although they are not always affordable and available all year round. Their high protein, low fat and cholesterol content make them a nutritional favourite. Snails contain almost all the amino acids needed by the body and most of its by-products are used for cosmetics and medicines. Most of the snails supplied to the African market are gathered from bushes and forests during the rainy season (usually between April and September). Because snails are very dormant during the dry season, they become increasingly scarce during this period and the market is starved of adequate supply until the next wet season. This makes the supply of snails very seasonal in many parts of Africa where they serve as food. As a consequence, snails can fetch much higher prices during the dry season (December to March) when supply often does not keep up with demand. 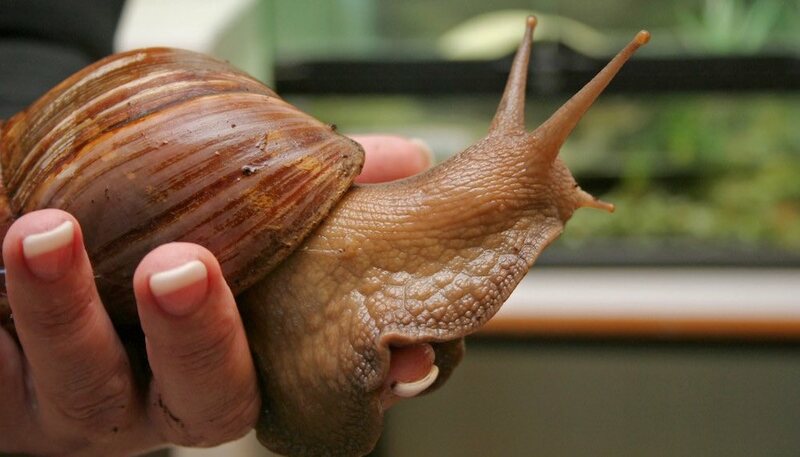 There is also growing demand in Europe for giant African snails. Apart from their great taste, many people abroad like to keep them as pets and keepsakes due to their sheer size (I was surprised too!). But never mind, you are likely to be very busy satisfying the local demand to bother about exports. However, it’s still good to know that such foreign market opportunities exist for this small business. If you’re interested in exports, you could read up the How to export to the USA and Europe section of our Dried and Smoked fish export article. What Is Snail Farming About? Shells can be used for ornaments. They’re cheap and easy to raise. Snail Meat contains anti-tuberculosis attributes. Snail meat is used in the production of local herbs to be used by pregnant women. Snail farming can be done part time. Snail farming can be done along side grasscutter farming. Edible snails are a part of regular meals in most households around the world. In Nigeria for instance, many homes prepare their soups with snails occasionally. Despite the infrequent use of snails in meal preparations in the country, the demand still exceeds the supply. This want doesn’t just show a large snail farming business opportunity in the country, but also shows the large potential in exports outside the country. A short list of some countries that consume edible snails are Spain, Nigeria, Algeria, Cameroon, France, Cyprus, Ghana, Malta, Italy, Vietnam, Laos, Cambodia, Terai of Nepal, southwestern China, and several parts of the United States. As long as people will continue to demand snails in their meals, it will constantly remain a lucrative business opportunity for agribusiness entrepreneurs to take advantage of. Snails have great uses in the cosmetic industry. Different skin creams are gotten from the Helix Aspersa, and can be used in treating scars, acne, wrinkles, and dry skin. The secretions from the Helix Aspersa under stress, can be used in the regeneration of wounded tissue. As a Newbie to Snail Farming Business your primary goal should be to take advantage of the seasonality of this market in order to gain premium prices for your snails. Target the high-end customers (hotels, restaurants and households) who can afford to pay a premium for a steady supply of the product. If you supply all year round, you are likely to earn lesser during the rainy seasons (when supply is in abundance) and more in the dry seasons (when the product is scarce). You could buy cheaply from the villages and other remote areas while the supply is up during the rainy season and maintain a healthy stock of large snails that you can unleash on your customers when supply falls in the dry season. But to achieve this, there is a very important condition. The size of your snails must be large and ‘intimidating’ enough to command a premium (high) price. For this to happen, you must start your snail farm with the right species (the Giant African type) and ensure that you apply proper breeding, stocking and feeding practices to achieve the huge sizes that will make you a highly sought after supplier. If your snails are bred well, they should start to reach market size from six to twelve months, although some farmers like to leave theirs for much longer. Presently, more than 90 percent of the snails supplied to our local markets are picked from the forests. While this has been the traditional supply source, our growing population and rising rural to urban migration rates make it unsustainable. An artificial intervention like snail farming is the only way to satisfy the growing demand. And as long as a huge chunk of the market depends on snails captured in the wild, nobody can assure a steady and consistent supply of large snails like a farmer who breeds snails in his/her backyard! I Want To Start Or Learn Snail Farming Like A Professional. Is There A Book With A Comprehensive Step By Step Guide? Since starting a snail farm can be extremely difficult for a person who has no clue on what to do, or only read an article, we’ve prepared a highly detailed snail farming e-book, showing exactly what to do every single step of the way till you reach the point of marketing. This e-book is perfect for beginners, as it will take you from a novice to a snail farming professional, and help you either make money by starting your own snail farm, or by becoming a snail farming consultant. We have put together a complete Snail Farming Package for beginners and Small Starter in Snail Farming Business, the Package contain everything you need to know to start making serious sustainable Income in Snail Farming Business. • Determine what type of snail species is right for your business. • How to choose a perfect site for maximum production. • How to construct a snailery. • The feeding process for the Snails. • How to successfully manage a Snail Farm. • The various Snail Farming tools to make your production optimal. • How to protect your snails against pests and diseases. • How to harvest, store, process, and package Snail meats. • How to market your Snails locally and Export them.